Guessing you are getting the brad thinks Paul and Fred thought the game would fail thing from either Reddit or Discord? I hate discord.... rolling chat that if you look away for 10 minutes you can never find anything. I've read all the publicly posted emails between Brad and Paul and Fred. It seems that they (P&F) were very very supportive early on, though clear that they could not work with the project in any way due to their contract with Activision. Things only turned hostile last Sept... No where in any of that does it look like they were expecting SC:O to fail or doing anything but being supportive of the new project. So yeah I do think that when they made the GotP announcement Brad tried to spin it as a positive (his initial posts to the media and even on this site where super super supportive) and then things just turned.... mean. Either there is a LOT of stuff that has not been made public, or something cause up until Dec it really looked like we'd have two games that mutually acknowledged each other and could happily co-exist. 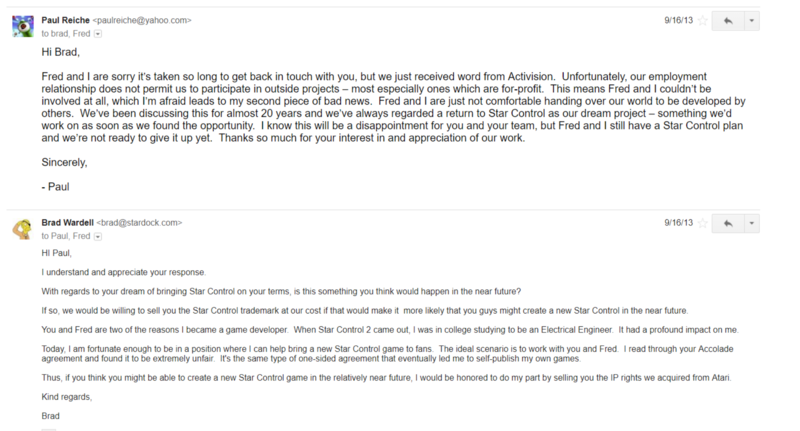 It would make sense for Fred & Paul to support "Star Control" because the trademark to "Star Control" isn't what's important to them as they have their own plans, all they ultimately want is the copywrite to the original art and stories which they still need to validate. With that copywrite, they could make contemporary versions of a UQM sequel that would count as derivative works, which are protected under the U.S. copywrite laws. Even if they don't make something with their win right away, it's still their legacy on the line whereas Stardock's would have been completely safe in every way. 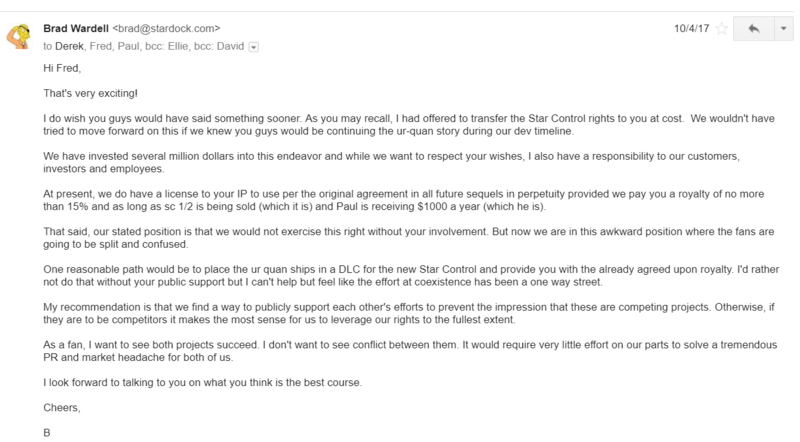 Even if Stardock loses most of their claims, they will undoubtedly keep their trademark to Star Control so their game will not be jeopardized. If Fred and Paul lose a majority of their battles, they will lose everything. Both parties have a chance to come to an understanding and walk away with what they want, but they are emotionally invested in the dispute. In the interest of factual information, I'd be curious to see what P&F's most supportive comment to Stardock has been. Their support reminds me a lot of the girl who says "let's be friends" than someone who actually wants anything to do with them. At one point, Stardock was really excited that they were supposed to have dinner, but "schedules got tight". these points come from the Discovery period in which Paul and Fred were tasked with supplying documentation of work done on their new game so as to disprove the Stardock claim that the timing of the announcement of GotP was not simply made only to negatively impact SC:O before their beta launched. Just an important factual correction: the discovery just started. The schedule has it going well AFTER the amended pleadings. Amended Pleadings due by 7/16/2018. Close of Fact Discovery by 10/19/2018. Designation of Experts due by 10/19/2018. Rebuttal Experts due by 11/19/2018. Close of Expert Discovery by 12/14/2018. Dispositive Motion Hearing set for 3/13/2019 01:00 PM. Pretrial Preparation due by 4/10/2019. Pretrial Conference set for 6/12/2019 01:00 PM. Jury Selection and Jury Trial set for 6/24/2019 10:00 AM. So. Paul and Fred have not been "tasked" with anything. There is still a lot of time to task them under subpoena. Maybe they'll reveal their work voluntarily, but that hasn't happened yet. And lastly, they may be within their right to withhold the confidential work in their game. After all, the people who are trying to get a look at it are also the same people who are being accused of illegally copying their creative work. That's a pretty valid reason to keep that stuff confidential, and a judge might see it that way if the discovery gets contentious. This is why people need to actually read critically. You can't just take anyone's assertions at face value. And frankly, Stardock has said more things that aren't borne out by the evidence, and that seem to be directly contradicted by evidence, let alone common sense. In the interest of factual information, I'd be curious to see what P&F's most supportive comment to Stardock has been. Their support reminds me a lot of the girl who says "let's be friends" than someone who actually wants anything to do with them. Fred and Paul definitely did want to set some distance between themselves and Stardock when you look at their correspondance, but that's not unreasonable. If someone you've never met asks if you want to go skydiving with them, it's more than fine for you to say "no." If anything, Stardock was wrong to keep aggressively pestering them about projects. Stardock thinks that owning the SC trademark entitles them to all the creative content that was originally associated with it. Normally, they would be right, but because the content was negotiated separately from the SC trademark by Fred and Paul prior to auction, e.g. Star Control is different than UQM, an agreement which was then illegally violated before Stardock bought the SC trademark, Stardock's assumption is incorrect. If I grab a picture of a nebula from NASA's website and stick it into my telescope manual, I don't spontaneously hold the copyright to that nebula no matter how many telescopes I sell and therefore I do not have the right to grant anyone else exclusive use over that picture either. On the surface, Stardock is worried most about their SC trademark and allegedly IP rights to GalCiv even though they'll never lose that either. They state Paul and Fred are after it, despite that they never wanted the SC trademark in the first place. Losing SCO might just bankrupt Stardock since they sunk 5 years into it, so if there's any perceived threat to it then they will take it seriously. However, the chances of Stardock losing their SC trademark are incredibly low and after this much time they should know that, so they could just be throwing around this dispute to draw attention to the game in order to make more sales. They already know that fans will naturally side with Paul and Fred, so they want to paint themselves as a victim in order to get ahead of accusations of wrong doing. Even if Stardock lost the Trademark -- which is possible but unlikely -- it just means that no one has the exclusive right to use it. Which means everyone can use it, including Stardock. In some remote possibility that even Stardock is limited from using the Trademark -- which no one is even pushing -- then Stardock could just release their game under a different name. A Trademark is just a mark you use in trade. It's a name. Losing the Copyright means literally losing the right to any copies made/sold/distributed/sequalized of the original work. It means P&F can't make any kind of continuation. If Stardock has risked anything, it's actually including those original aliens in the new game. That's something they could be enjoined from doing, and could mean losing their release date. Just to be cynical for a second, and let's just say Stardock is doing this on purpose, so that they might be painted the victim. Has anyone actually seen the original aliens in the game itself, or is it all concept art? Possibly, or possibly not, apparently it's possible it can be ruled that no one can use it, though that's very unlikely. Yes, Paul and Fred stand to lose a lot more, so it's good they have a stronger case for their desired outcome. 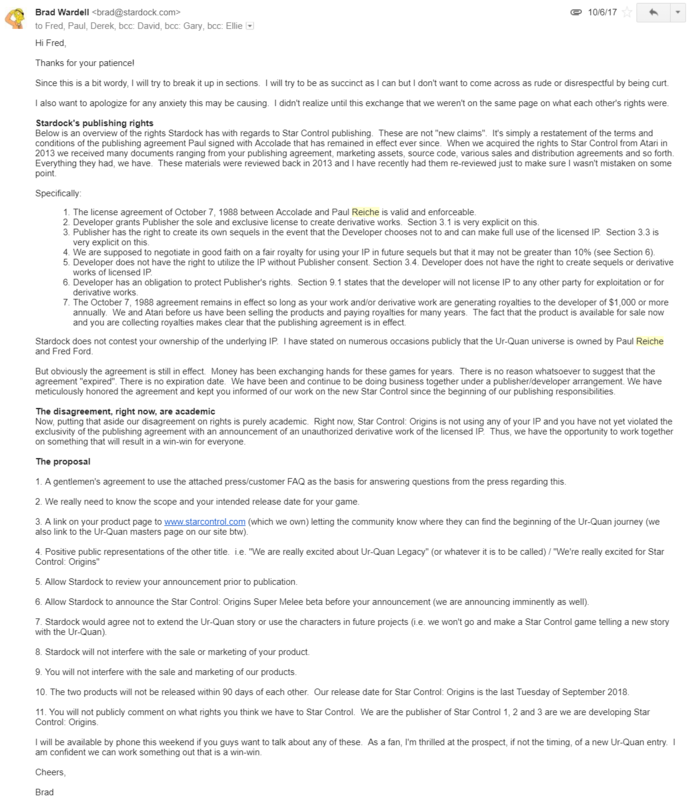 If they do lose the copywrite validation though, then they do have to dispute each trademark claim with Stardock which is there the funding is more important, because that will be a battle for the trademark to every single race, one at a time. Clearly Stardock has the funding to raise claims to all those trademarks, but Fred and Paul may not have the funding to dispute those claims, so Stardock would get them by default. However, I don't see that they claim to have created every single thing themselves in the first place, and it's uncommon for a creator to claim they did every piece of dirty work. They were in charge of making most of the decisions, wrote most of the story, and were generally trusted with all of creative content by the Accolade staff, much like how a creator employed by a network would be trusted with creating a TV series. Even if they didn't physically make everything themselves, which rarely happens except with indie projects, they are responsible for shaping the original game into what it was, so it still makes sense that they are the original creators of the game. I think you're fundamentally misunderstanding the relationship between Toys for Bob (aka Paul and Fred) and Accolade. From what I understand, TfB was the game studio, owned by P&F, meaning that P&F had control over creative content not by the grace of Accolade but because they had the top position in the company. Accolade, then, is the publisher, who licensed the game from TfB in order to sell it. It's more a contract between equals rather than an employer-employee type of contract. This is all non-rigorous and taken from memory, so it's likely wrong in some details, at the very least, but I'm pretty sure that the broad strokes are correct. Of course, I'm not a lawyer. Well, let me put it this way: 20th Century Fox owned the TV show "The Simpsons," but Matt Groening is still the "creator" of the show. The creator status is independent from who owns the brand which is what Stardock is attacking in one of their claims and what seems to be what you're hinting at. From what I understand though, Fred and Paul made an additional effort to negotiate with Accolade the rights to make sales with the content that happened to be used in the original SC series, so Fred and Paul should legitimately already hold the copywrite to all the content that was used in the original SC series anyway. Licensing does exist, but variations of licensing like exclusive sublicensing do too, so I doubt Accolade's original goal was to obtain only a non-exclusive agreement, but if they did, that would only make Fred and Paul's case stronger. When I read Stardock's claims objectively, it still seems odd how audacious they are. They're claiming they literally own everything, even Ghost of the Precursors, despite never having anything to do with any of its creation, and then they're claiming all of this despite that they will continue making a profit from SCO regardless of if Fred and Paul validate their copywrite which means they have less grounds to win the trademark claims. If GotP was truly the passion project that Paul and Fred claim it to be, they should have had those elements designed in their free time YEARS ago. This was not a release announcement; it was a "We're finally able to start" announcement. You seem to be saying that P&F were somehow obligated not to announce that they were going to do a new game until they had things to show off for it. I see no justification for that obligation; as a fan of SC2, I'm glad they decided to tell us as soon as they started, rather than waiting. I have no expectations that they have anything done when they've just started, nor that they will have anything more to show before the suit is over, because it would be pretty stupid to spend time working on something they might lose the rights to do, even if they had time to spare for it. Unlike Stardock, they don't have employees to make progress on the game while they handle legal obligations. Also, I think after waiting this long for the game, I'd almost rather not be 'spoiled' by previews. Based on SC2, I trust P&F to make a fun game, especially when they (hopefully still) have the financial and legal independence to take their time and really do it right. That goes double if they manage to get some of the old band back together. if the Trademark was not valuable to them why market it as the Sequel to SC? To let all the SC2 fans who were wondering where the Precursors went and what happened to the Mark II know that they were finally going to get canonical answers? Why officially announce the game RIGHT before StarDock's marketing blitz for SC:O which Paul and Fred knew the dates and plans of because SD had given them that info. At a broad level, the timing is easily explainable: P&F had told Brad in 2013 that they intended to do another game someday, and both Stardock and P&F intended to time their announcements around SC2's 25th anniversary. P&F told Brad that directly, so there's no reason to infer malice from the fact that they occurred at around the same time. With that said, after Brad insisted that he had exclusive and perpetual control of their IP, P&F seem to have been rather put out with him - understandably, in my opinion. And they did make their announcement a few weeks early, so it's possible that they moved it out of pique. If they did, I'll grant that it wasn't very nice, but given how Brad kept trying to bully them with an expired contract, I can understand them not being very nice. They could have named it anything and people would recognize it, also at that time SD would have done a cross promotion and let them call it SC: GotP probably for free. "Free" needs to be in quotes here. Sure, he might not have required any money from them, but Brad was insisting that they give up something more important to them than money: Their independence. He wanted them to license his trademark, thereby giving Stardock an IP foothold in their game. Their consistent position for many years has been that they have the rights to the universe from SC2, and don't need anyone's permission to make a new game in it, and they weren't about to do anything that might jeopardize that. "Fred and I are just not comfortable handing over our world to be developed by others. We've been discussing this for 20 years and we've always regarded a return to Star Control as our dream project - something we'd work on as soon as we found the opportunity." Does that sound like they're only declining because of Activision? To me, I read that as saying (approximately): "Sorry, we're not interested in working with you or anyone on this, now or ever." The problem was that Brad wouldn't take the hint, and kept pestering them about it for the next four years. October 4, actually. That's the day when P&F told Brad that they were planning to do a new game, and Brad replied by telling them that contrary to all of the reassurances he'd given over the last four years about recognizing and respecting their IP rights, he was claiming to have exclusive and perpetual control over their IP, such that they had to work with him if they wanted to do a new game. There's no mystery here; Brad started the fight when he sent that email. And I'll note that none of Stardock's legal filings have ever tried to justify or explain (or even mention) those claims; as far as I can tell, Brad was just flat-out lying. No where in any of that does it look like they were expecting SC:O to fail or doing anything but being supportive of the new project. Supportive, yes...they didn't have a problem with SC:O being a "Star Control" game, with a similar style of gameplay to the earlier ones. They just don't want it to use any of their setting. They just don't want it to use any of their setting. Which is also exactly what the fan base wants, which is perfectly compatible with SCO succeeding. I've seen issues people bring up with SCO that they're using knockoffs of the original Arilou and Chenjesu and possibly the Spathi, which they don't need at all since they definitely bought the SC trademark and Fred and Paul didn't want it. Stardock has a chance to pull those races out before SCO is released, but if they don't, I hope the law makes them. Well, that is a part this issue, whether or not they actually had "plans" for it, which Stardock calls into question in order to argue Ghost of the Precursors is just a facade. After 20+ years though, that's not unreasonable to point out. However, many game publishers negotiate either some kind of non-compete clause in their contracts with developers or an exclusivity agreement, so it is also possible Fred and Paul literally couldn't make any new content for an outside game even if they wanted without it being owned by Activision or being slapped with a huge fine. Fred and Paul never needed the SC trademark though which is why they turned it down, because the SC trademark is separate from the artistic content, and the CEO didn't understand that. Rather, normally this particular statement would be wrong but it'd be hard to tell because something else would entitle them to all the creative content. Also, you keep mis-spelling copyright as 'copywrite'. It's the right-to-copy, not something to do with writing. From what I understand, the two are normally sold together, but in this instance with SC they weren't, so Stardock should only have the right to the SC trademark, not the artistic content. You're right I misspelled it, I'm used to writing it that way from communicating with ad agencies and graphic designers, but it should be copyright. Stardock has applied for Trademarks in Pkunk, Ur Quan Masters, Precursors, Chenjesu... the whole gamut. Add that to their (more credible) Trademark in "Star Control", and there's almost no way for Paul and Fred to so much as talk about their new game without potentially infringing Stardock's alleged Trademarks. "Hey guys, we're giving you an update about the untitled game we're working on. We're currently writing the story, which we can't share, and we can't tell you if it will feature characters from any previous games we worked on, because those are currently the subject of a legal dispute, that we hope to win." And hey, maybe they've done the bare minimum of development, because they could lose everything if Stardock can successfully invalidate their copyright. Also, one of Stardock's settlement demands was to have Paul and Fred turn over any notes, sketches, drawings and other material they started brainstorming over the past 30 years. They then wanted Paul and Fred to sign a joint statement saying that they are happy to pass the torch to Stardock to tell the Star Control story. In the absence of that settlement, Stardock has stated quite openly (and brazenly considering it's the subject of a lawsuit) that they are finding a way to copy elements of the original aliens without crossing the line into copyright infringement. Why the hell would Paul and Fred want to publicly disclose so much as a sketch or an idea of what they're working on, when the other side seems hellbent on appropriating it? One of the most interesting developments in the pleadings is that Paul and Fred mentioned seeking a declaratory judgment about their Copyrights in the aliens, and Stardock's Trademarks in the aliens. If they pursue it, a judge would have a hearing on the aliens issues before the other issues (like the legality of Stardock's steam sales, or the legality of P&F's GOTP announcement). Which makes sense. Paul and Fred can't safely develop their game (or talk about their game) until this issue is settled. And frankly, Stardock should probably hold off on adding those aliens until the issue is settled. But I'm sure they've factored the risks into their respective strategies. I might be overstating it, because it's one of several legal strategies being pursued by both sides, and it remains to be seen what the next step is. But I have a feeling it won't be a straightforward discovery. They are trying to trademark the races because Stardock considers those races to be part of the SC trademark that they purchased, or at least that they can enforce it being more closely associated with their brand than Fred and Paul's. Fred and Paul seem to disagree with that as it is associated with their original creative content, and although Stardock is confident in their side, their company never actually bothered to trademark those names before recently, though it doesn't seem Fred and Paul did either. However, because no one laid claims to the specific trademarks for the races previously, or allegedly I should say, it's still rational for Stardock to use those races, but only as a DLC because they can get away with it until they're ordered to stop if they ever are. They won't get fined since the Fred and Paul's original claims to those races are still being disputed. Then, even if Stardock loses the trademark claims, it won't affect their sales because they can just release a statement that says something akin to "due to the unspeakable tyranny of Fred and Paul, we have been ordered to take these wonderful races you love from our game." so that they retain a positive reputation among their player base. The discovery magistrate has responded to the joint letter of disagreement about the subpoena to P&F's PR company. However, she didn't rule on it, Apparently the letter was not in her specified format, so she told them to re-do it...and also told them that since their final briefs were in, they should also make any arguments about whether the material to be gained justifies the effort involved. This bit reads to me as though the judge is likely to eventually allow the subpoena of Singer & Associates to go through. Am I off base? If not, I hope whatever emails got passed back and forth between F&P and this company are nothing too scandalous. Stardock seems to think they must be.